ITATOOLS has announced the release of new ITA23 battery operated plastic strapping tools with vibration sealing for high tension applications, available locally from the company's exclusive Australian sales and service distributor, Live Industrial . 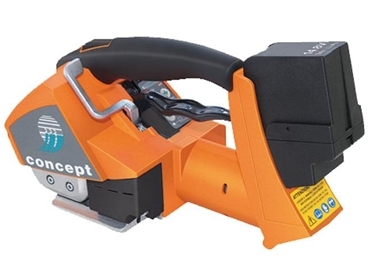 These battery operated plastic strapping tools are lightweight, weighing in at less than four kilograms, while delivering significant pulling power of up to 5,000 N.
Easy to maintain and operate, they feature a large push button and lever system, and require no mechanical adjustments to change strap sizes or types. This ensures their suitability for use by manufacturing companies that use PET strapping, and require high tension on their packs. ITA23 battery operated strapping tools also feature Lithium Polymer batteries, which have a quick charge time of approximately 30 minutes, with one charge capable of processing up to 200 strap cycles, depending on the application. Each battery supplied with these strapping tools has a life of approximately 2000 charge-cycles, and unlike standard batteries, has no memory effect so it can be charged at any time. Designed to be operated with 16mm x 1.05mm and 19mm x 0.8-1.27mm PET plastic strapping, ITA23 battery powered plastic strapping tools have a tensioning speed of 12m/min, with individual tension adjustments ensuring correct strap tension (up to 500kg) and reducing load movement. This makes these devices an ideal option for use in most high tension strapping applications across all industries.